Last week I mentioned the Tufted Duck that had suddenly appeared in Australia and it is not the only vagrant duck to have chosen to reside in Australia at the moment. 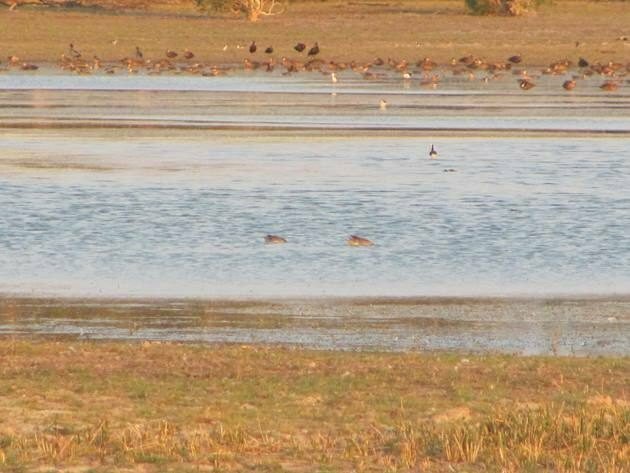 With so much of the environment in Australia that is inaccessible at any time of year it does beg the question as to how many different bird species do arrive and then leave and never get observed! A good example of a bird that came and then left unobserved was the Eurasian Hoopoe in 2014. The first record of the Eurasian Hoopoe in Australia was well documented in 2011. Then a camera was set up in the North Kimberley on Aldolphus Island during the wet season and when the footage was downloaded they discovered a Eurasian Hoopoe had been visiting the island! There had also been an increase in bird numbers since the previous survey in 2008/2009 and the number of birds had doubled. Garganey had been reported in Australia prior to last year, but not for many years and so when there was a report of three at an ephemeral lake not too far from home on November 2nd we went in search of them. It was already mid-afternoon by the time we reached the lake with another birder not far behind us. We scanned through thousands of birds and there was plenty to see and the light gradually improved. The heat haze initially had made observations far from ideal as is often the case in Broome, but we were not going to give up! All of a sudden we observed them and realised the two smaller ducks that seemed to be constantly feeding were the two of the three ducks we were looking for. 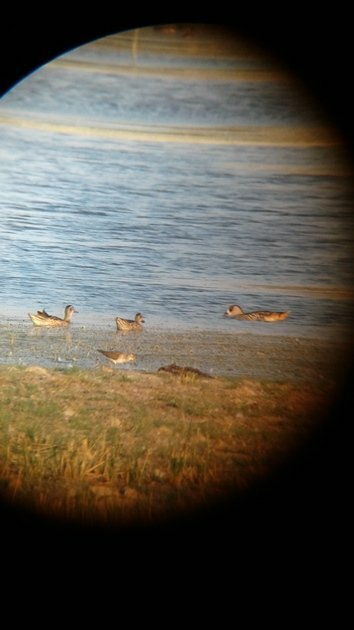 We were busy observing them for some time and then attempted a few photos of the Garganey through the scope in the fading light. We moved forward slowly and the Garganey continued to feed in the fading light. 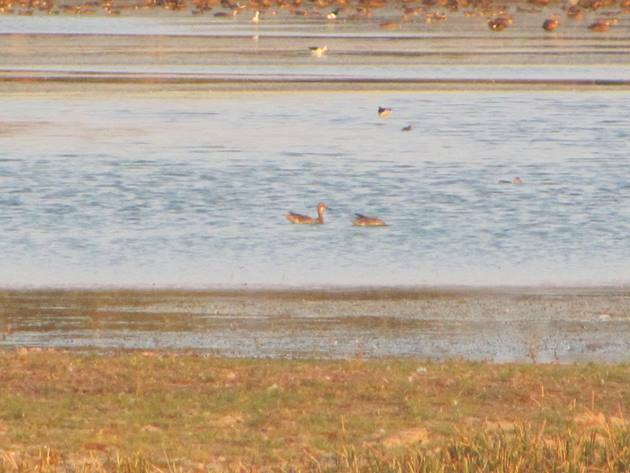 They are a lot smaller than the Grey Teal and Pink-eared Duck that swam by them. The Garganey continued to inhabit the area right through to the end of 2018. Then on a bush-walk on January 5th we were delighted to see that they had remained in the area and could once again go onto the Year List. We had been very pleased to observe them initially, but to have them remain in the area was even better! We found the Garganey quite easily on this occasion thanks to a Swamp Harrier that was busy upsetting all of the bird-life. We had expected to add a few new birds to the year list that day on the bush-walk and the Brown Quail had also been a nice surprise. 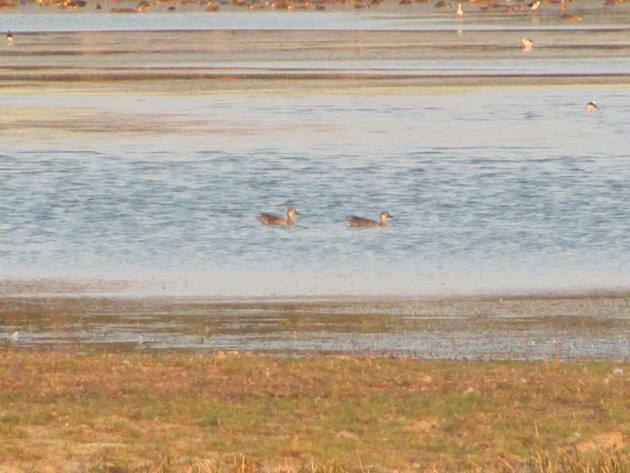 The Garganey visiting Australia late last year had even been mentioned in the news! 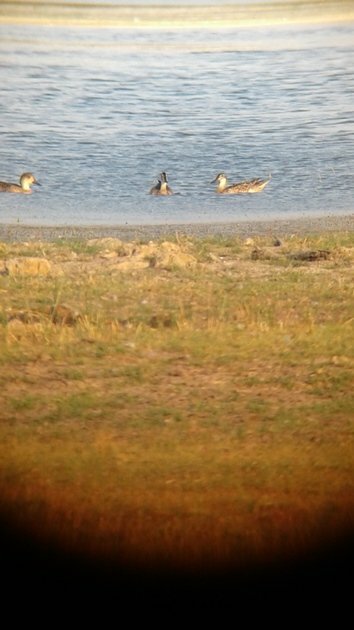 Several birders took much better photos than myself of the Garganey and they were submitted to eBird. We are incredibly lucky that the birdlife around Broome is so diverse and that we are also privileged to have so many vagrants drop in. We don’t even want to try and guess what vagrant bird species might show up next. However, there has been a tropical low that has become Tropical Cyclone Riley this week and anything might blow in! A Common Noddy would be a good bird to observe again at close range!